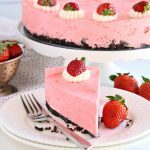 This Easy No Bake Strawberry Cheesecake is the perfect summer no bake dessert that's bursting with fruit flavours! Perfect for barbecues and summer parties! Combine the Oreo cookie crumbs and the melted butter in a small bowl and press the mixture into the bottom of a 9-inch spring form baking pan. In a small bowl, combine the Jello powder and the boiling water and set aside. Whip the cream cheese in a large bowl with an electric hand mixer (or stand mixer), adding in the powdered sugar a little at a time. Slowly pour in the Jello mixture while whipping on low speed until it's fully incorporated (scrape down the sides of the bowl). Gently fold in the whipped cream until fully incorporated. Pour the cheesecake mixture into the spring form pan over the Oreo crust and smooth it out with a rubber spatula. Chill the cheesecake in the freezer for 4 hours or overnight. Remove from the freezer and let stand in the fridge for an hour OR at room temperature for about 30 minutes before serving. Garnish with additional whipped cream and fresh strawberries, slice and serve.